Scott Lovat | Scott Lovat is Scotland's favourite children's entertainer, providing children's entertainment for over 30 years. I provide many different types of magic and puppet shows for private parties, schools, nurseries and other types of events. 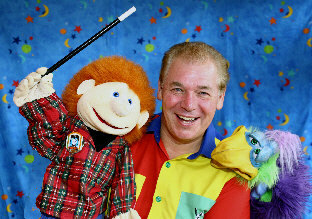 For over thirty years, I have been entertaining children in and around Central Scotland. If you are looking for something different, I will be more than happy to tailor a show to fit your requirements. Thank you so much for a magnificent party for the girls, they were over-joyed with the show. The best thing, as a parent, is seeing the smiles of joy on all of the children's faces, and the party will be a happy memory for many years to come. Scott, your show was absolutely the best we have seen, you are a gem found. I would just like to thank you for Amy's party on Sunday. She had a great time, as did all the children and adults! I have had a few mums coming up to me at playgroup saying their child really enjoyed the show, and have kept talking about it. Just wanted to say thank you for my child's party. He had a brilliant time, and was talking about you for days after.